The report provides information on VMs powered off throughout a specified time period. 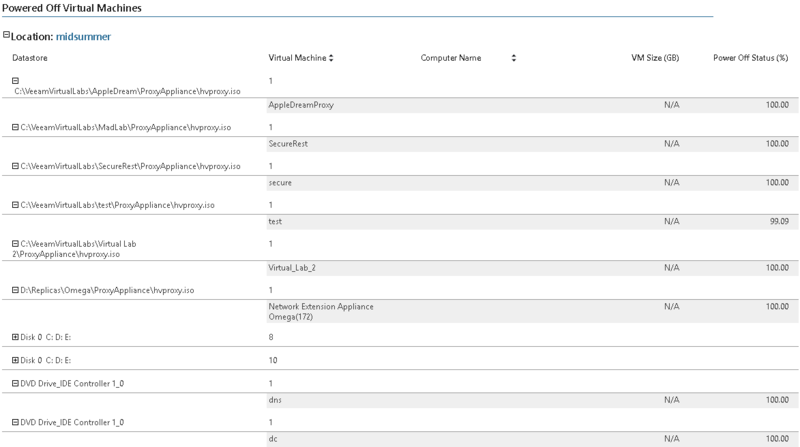 The Summary section shows the total number of VMs in the selected scope, the number of powered off VMs and their total size on disk. The Powered Off Virtual Machines table lists powered off VMs, their location and disk size. The Powered Off status (%) column in the table displays the amount of time during which a VM was powered off against the time of the reporting period in percent. The report allows you to track VMs that have been in the powered off state for a specified time period. Since powered off VMs consume space required to store their disks and configuration data, you can review storage usage and relocate these machines, or decommission machines that you no longer need. Interval/Interval Type: defines the time period to analyze in the report. Note that the reporting period must include at least one data collection session for the selected scope. Otherwise, the report will contain no data. Power Off Percent: defines the threshold for the amount of time when a VM was powered off against the amount of time in the reporting period (in percentage). If the time during which a VM was powered off is less than the specified value in percent, the report will not analyze this VM.